We all love a great Christmas garland. I just desired to create something I hadn’t seen done before. A Christmas garland made from twigs would be that. It was so simple to make, and had the rustic quirky quality I gravitate towards. 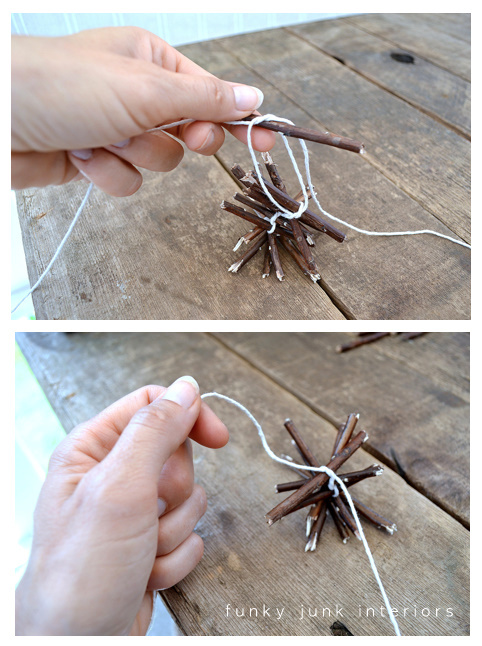 So… let’s make a Christmas garland from twigs / sticks / branches! 1. Find your twigs of choice. I happened to land this bunch at a thrift store for $10. The uniform shape made them very easy to work with. 2. Decide how thick you’d like your garland to end up. 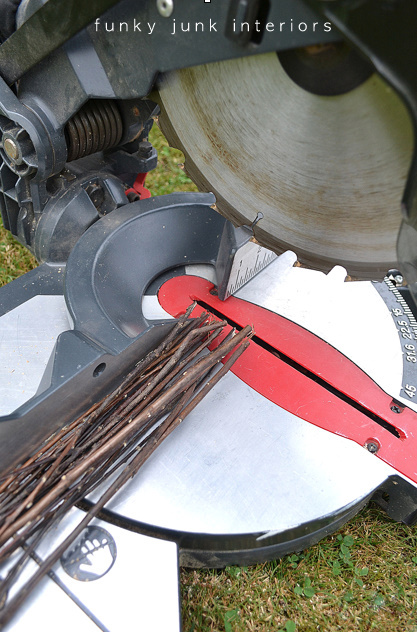 Cut twigs to desired length. 3. Measure your first piece of string at a generous 2 arms length. 4. Finding the centre of the string, tie one twig tightly with one or two knots. 5. Create a loop, slip a twig in place, and tighten string. 6. Continue adding twigs and knotting them tightly until you run out of string. 7. After accumulating several lengths, tie them together and trim string. They are VERY fun to play with! wowie! what a job it must have been to create that. But the end result is totally worth it – so lovely! Love the garland! I so wanted to try it, and am wondering if I have to do the George Washington thing and cut down a tree in my neighbor’s lawn tomorrow. jk I have only HUGE cedar trees. Thanks for the tutorial. I put your Christmas tree/ladder blog on my FB page and people were astounded. I love seeing you grow in your abilities and your creativity. Your blog is helping me be more thankful for the home I live in, because I really don’t like split levels. I decided to decorate it more creatively with items I love. I’ve been holding on to willow branches I’ve had for years after making a couple of willow baskets (talk about tough work!). Thanks for the great idea and tutorial. I can now use them and shout out loud: “See, I told you they’d come handy some day! Love that garland!! Thanks for the tutorial. I am always amazed at everything you do, vintage soda bottles hanging from the bannister…so cute and clever!!! I loved that garland when you first showed it. So beautiful!! But you are so right..a movie would definitely be in order!! Ha! You are a crazy genius!! Crazy because sitting there and making all of those is crazy, but so very genius. I love love love this idea. Wish I hadn’t let the garbage men take all our sticks when we were cleaning up the yard. Next year I’m hoarding them all, even from the neighbors, lol. What a great idea, looks like a lot of work. So I am now on the look out for twigs. Not any in my yard so I have to go scouting. 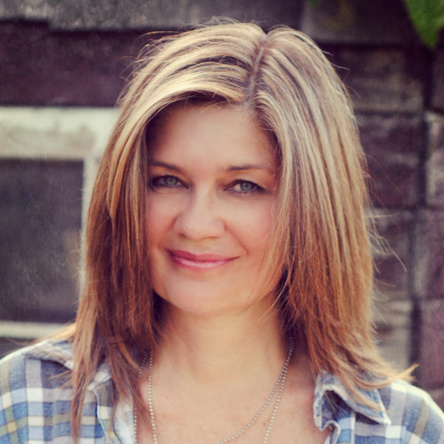 I love your blog and how creative you are. You have a gift for seeing things most people don’t. Thanks for sharing all your wonderful ideas. Love this! It looks good everywhere you put it, too! I was out collecting twigs with my son last weekend for my own (not so) little twig project. Nursing a gigantic bruise on my leg and we broke a snow sled hauling it all back! Wish I would have bought a bunch for 10 bucks!! I love it! Maybe I’ll try one to match my dried orange garland! Donna I love your garland. A few years back I bought some twig garland at the Dollar Tree. really good on your stairway. Actually it would look good anywhere. 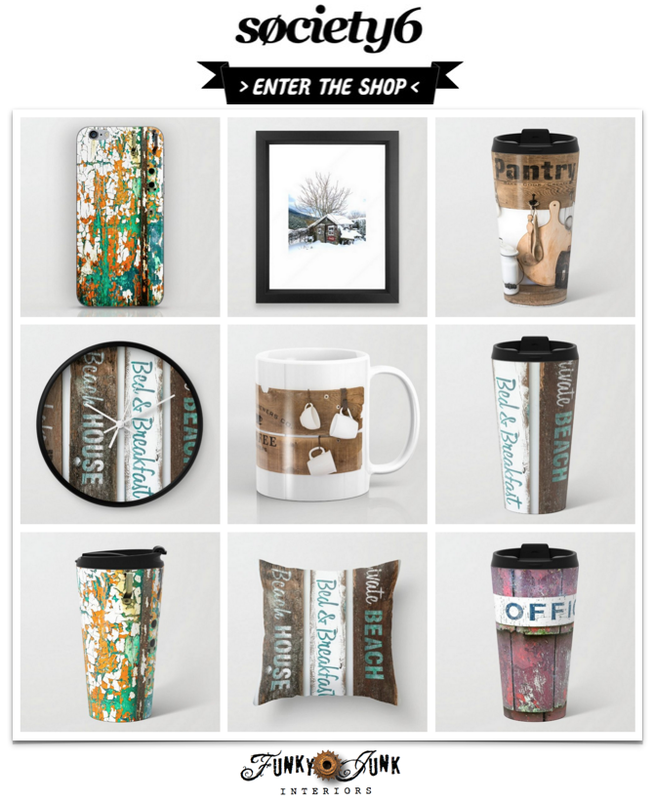 my kind of craft project …and could be free,too! You’re CRAZY! I love your twig garland! I have a kinda twiggy hanging lamp (it’s all your fault) which I’ve prettied up for Christmas. Now this?! Maybe if I start this year…. Everything is beautiful, as always. It’s such an easy garland that could do so many things! What a great idea. May have to try it for next year. By the way, I just love your steps. They make me smile every time I see them. Merry Christmas! Wow! So impressive! I’m pretty sure if I tried to make that my back would officially break before I even got finished. Oh you brought back memories with this. I made a stick garland with beads as a small girl. My Dad drilled a hole in each stick. Every so many sticks I put beads on. It was great quality time spent with my Dad. We made it for Mom! Just viewed your whole Xmas home decorating post and was blown away! You make the ordinary look extraordinary!! The twig garland looks awesome. Can’t do it this year but will start gathering twigs for next year! Thanks for sharing. You go girl!! Oh my word. This is so fun and so stinking cute! I can’t decide which is my favorite. I think I’m leaning toward the “clothes line”. Love it all! That is so cool !!! Thank you for your awesome tutorial ! What a neat idea. I have to tell you every time there’s a picture of your steps I have to smile. They are cool. Donna … your are one amazing lady.The garland is very nice, but I would not have the patience to make it. I so enjoyed the tour of your home. I especially love the sapling tree in the burlap bag. Audrey Z. at Timeless Treasures. Holy cow..That garland is awesome..Thanks for sharing.. 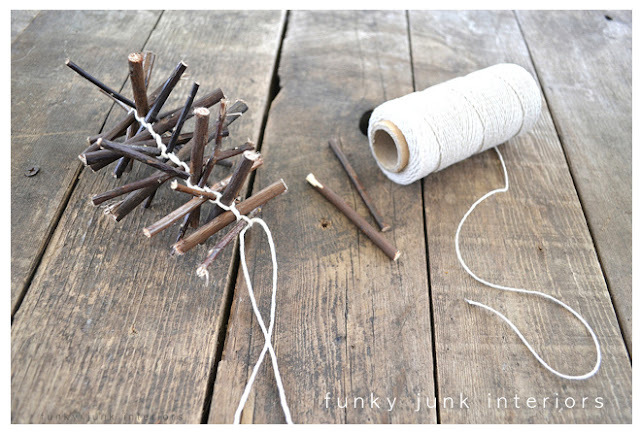 I love twigs and anything you can make with them. This is very cool. I’ve pinned it! So cute, great job, as always! What a gorgeous tree! I love the banner you made, too. The garland is perfect for a rustic style holiday. LOVE this! Thanks for the tute!! Your home is so beautiful and festive, Donna! The ladder tree is so completely unique! If you have the time, I would like to invite you to link you tree up to the Bloggers Block Party Christmas Tree Party which I am hosting and is currently in progress! I would be delighted if you did! I made one! Thanks for the great tutorial. Get out!! You’ve Donna, you’ve out did yourself AGAIN!!! I’m making some for our house!! 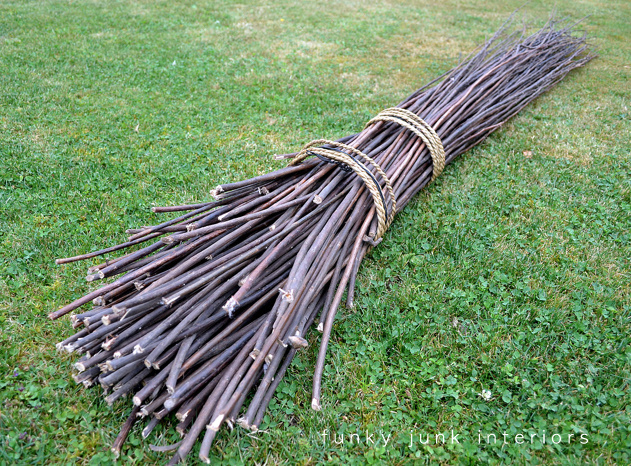 I love the deep brown color of your twigs. I can’t wait to go out in the yard and see what I can come up with. At the rate I’m going I won’t have any landscape left for spring!! ps – A step ladder tree?? Are you serious!! I admired your picture several times before I read the words you typed and never even registered there was a ladder in the picture! You have such a great mind! 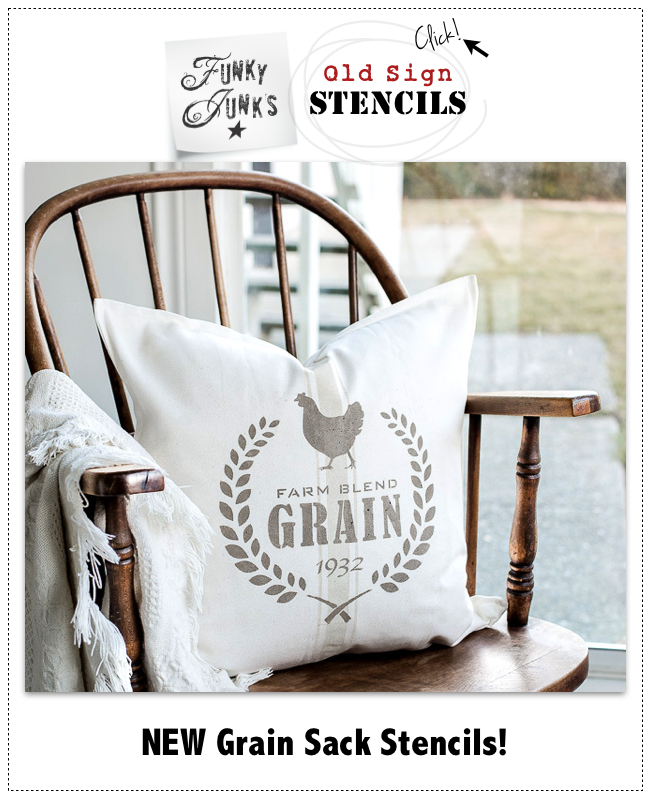 Thank you for being so creative and inspiring in such a funky, rustic, affordable way. Have a Merry Funky Christmas!! seriously genius! I am so pinning this for next year. Thanks for sharing! Happy Christmas to you and yours! Love this! I had a thought though… What about using some cinnamon sticks interspersed throughout? It would give such a lovely holiday smell! 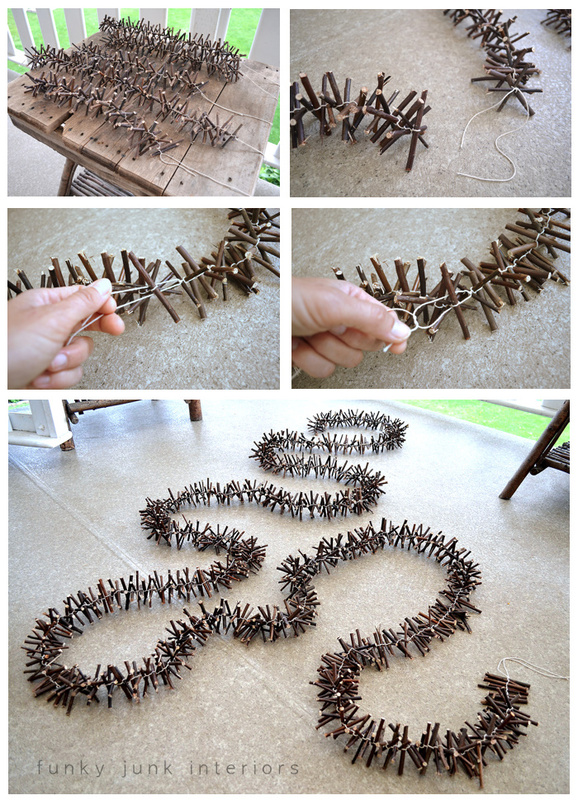 Now that I have about a million branches down… I think I will make this! LOVE YOU!! Love your stuff. You inspire me to try harder. I want to be a junk salvager mixed with nature finds. I just get stifled sometimes or scared to step out and take more chances. You make my heart feel like it can take more risks. Great Idaa!! Love it. We are doing a woodland theme this year and this would be perfect. Love the twig garland , but I love all your stuff I have seen thus far …I am like a kid in a candy store …having fun checking out your work ..and creativeness.